Constellation Lepus the Hare, is a southern constellation sitting below constellation Orion, between constellation Eridanus and constellation Canis Major. 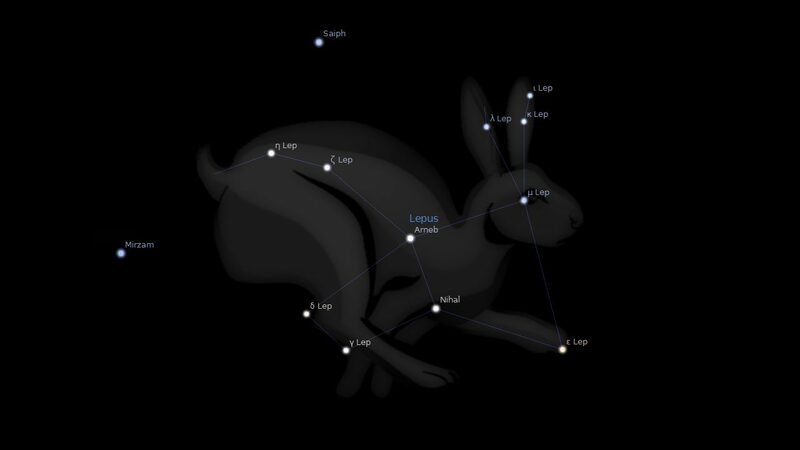 Lepus spans 18 degrees of the Zodiac in the Sign of Gemini, and contains 2 named fixed stars. A young man of the Isle of Leros greatly desired a hare and brought some over, for none were to be found on the island. The other inhabitants also wished to keep hares, but eventually the animals multiplied to such an extent that there was not enough food for them and they devoured the corn in the fields, whereupon the inhabitants joined together and destroyed them all. Lepus is located just below Orion and westward from his Hound (Canis Major)… Aratos characterizing its few and faint stars by the adjective glaukos. 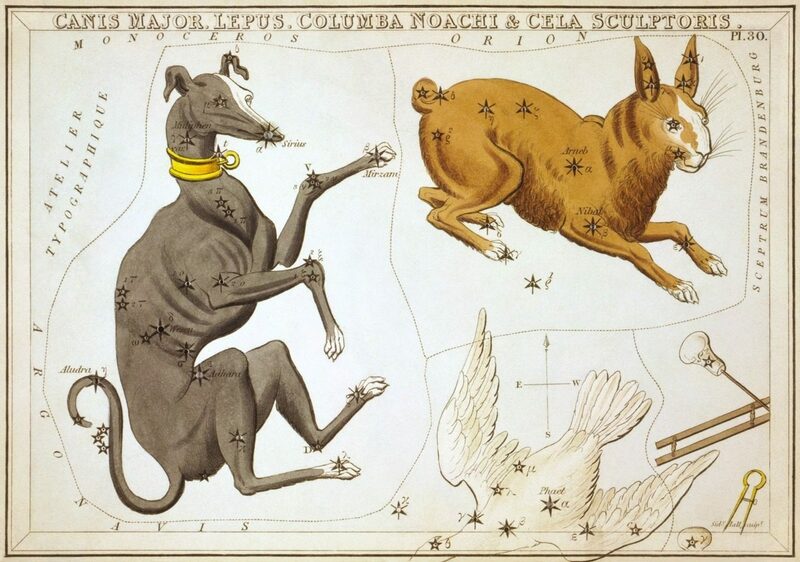 With the Greeks of Sicily, the country noted in early days for the great devastations by hares, the constellation was leporis (hare), whence came the fanciful story that our Hare was placed in the heavens to be close to its hunter, Orion. The Arabians adopted the classical title in their Al Arnab, which degenerated into Alarnebet, Elarneb, and Harneb; and the Hebrews are said to have known it as Arnebeth; but the early Arabs designated the principal stars — alpha, beta, gamma, and delta — as Al Kursiyy al Jabbar and Al ‘Arsh al Jauzah, the Chair of the Giant (Orion) and the Throne of the Jauzah (Orion). In the Persian planisphere the first constellation was pictured by a serpent. In the Denderah (Egyptian) Zodiac it is an unclean bird standing on the serpent, which is under the feet of Orion. Its name there is given as Bashti-beki. Bashti means confounded, and Beki means failing. It is a small constellation of 19 stars (all small), three of which are of the 3rd magnitude, seven of the 4th, etc. 1. Fixed Stars and Constellations in Astrology, Vivian E. Robson, 1923, p.49. 2. Star Names: Their Lore and Meaning, Richard H. Allen, 1889, p.264-265. 3. Astronomica, Manilius, 1st century AD, p.313. 4. The Witness of the Stars, E. W. Bullinger, 33. Lepus (the Hare) .